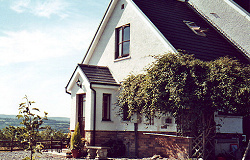 Bryndolau and Kites’ Nest Cottage are situated off the beaten track, in a quiet, rural setting at the end of a “no through” lane and are an ideal base for exploring Wales’ most undiscovered county of Carmarthenshire – “The Garden of Wales”. 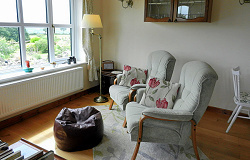 Kites’ Nest is a contemporary cottage extension to the main house finished to a high standard and providing excellent holiday accommodation for two people. The cottage has an open-plan design. Downstairs is a kitchen/diner and comfortable living area. Stairs lead to a barn-style bedroom with double bed and modern en-suite shower room with w.c. and hand basin. There are views from the window along the Brecon Beacons towards Llandovery.